You may think stone surfaces like granite or marble are the only choices for a kitchen remodel or bathroom design if you want to achieve a luxurious appearance. If you have already seen our Definitive Guide to Kitchen Countertops, then you know that there are a wide variety of countertop materials on the market that go far beyond the traditional offerings of natural stone. One of the most popular surfaces is engineered quartz, which has become an increasingly popular choice among designers and homeowners, and with good reason. 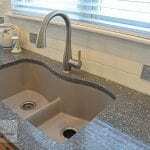 Let’s explore why this particular countertop material is so popular. The clue is in the name, as engineered quartz is a manmade product that combines ground quartz with resins and pigments. The result is a highly durable material that comes in a variety of colors, patterns, and textures. It is offered on the market by various manufacturers, who create slabs of the quartz product that are fabricated to fit each project. What are the pros of using engineered quartz in a kitchen remodel or bathroom design? It is highly durable, with the combination of natural stone and resins producing a nearly indestructible surface. Quartz is perfect for a busy location where you may be clanging pots and pans or setting down a hairdryer. It is so strong that quartz is less likely to chip or crack than granite. 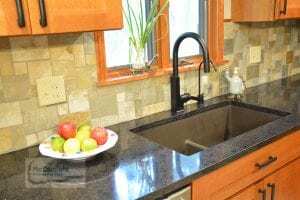 Quartz is nonporous and therefore is quite resistant to moisture, grease, and the resulting stains that can be so prevalent in kitchens and bathrooms. Don’t worry any longer about splashing grease while cooking, spilling red wine, or dropping a bottle of make up on the bathroom counter. Quartz has you covered and will resist the impact of these substances! This high resistance to liquids and stains means quartz is also very low maintenance. There’s no need for special cleaning solutions or extra scrubbing, just wipe it clean with a cloth and your countertop is good as new. You can also rest assured that a simple cleaning will leave your surface germ free since this nonporous superhero is also antimicrobial. The sky is the limit for kitchen and bath design options when using engineered quartz. Since pigments can be added during the engineering process, you can achieve a wide array of color options to suit any kitchen remodeling or bathroom design color scheme. Select a surface that mimics natural stone or go for a solid color in a matching neutral or bright contrasting color. Quartz is also the ultimate multi-tasker. It is an ideal choice for kitchen renovations, bathroom remodels, laundry room work surfaces, mudrooms, or any busy space in your home. In addition to being used for countertops, engineered quartz can be incorporated as a backsplash or wall. Although quartz does an excellent job of mimicking natural stone surfaces, it cannot achieve the same organic appearance of granite or marble. If you are in love with natural materials, you may want to stick to stone or at least incorporate a natural surface for part of your countertop. Granite and marble have the luxurious image that you assume come with the higher price tag, but it is important to note that engineered quartz is also an expensive surface. It will give you a beautiful result and last for a very long time, but you will pay top dollar for it. Finally, quartz’s real weak spot is high heat. Although it is heat resistant, quartz cannot withstand high temperatures, so do not place very hot pots directly on your quartz countertop as it will damage or discolor it. 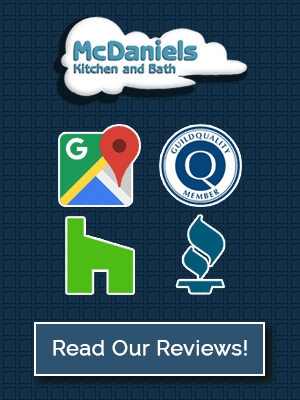 Our showroom is an excellent place to get started in picking your new countertop, and our experienced kitchen and bathroom design experts can tell you more about quartz countertops and how it compares to other top countertop surfaces. Check out more examples of countertop styles in our kitchen design gallery, and then call us on (517) 258-1722 to learn more.